The strike action, which seemed unlikely a year ago, was a tremendous step forward, and the solidarity displayed by other union members and students from around the city show that the public supports them. Unfortunately the strikes do not seem to have moved President Bollinger, who still refuses to even recognize the union; a fact which has caused some rank and file members to consider escalating their tactics as the end of the semester approaches. 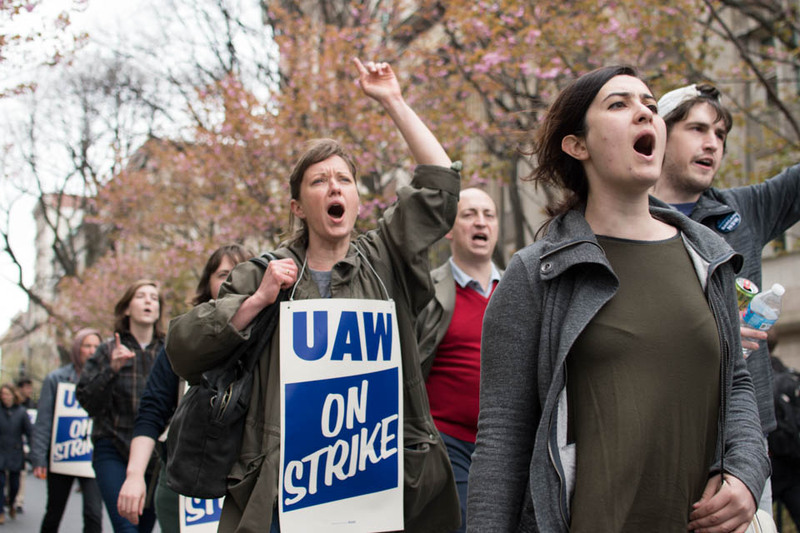 Although the strike had, from the start, been scheduled to end on April 30, the Columbia Spectatorreported that a resolution to continue the strike indefinitely had been gaining support among several rank and file activists. This clearly shows that far from being over, this fight has in fact just started, and that Columbia graduate workers are now thinking and discussing the best ways of escalating and continuing the struggle, which may or may not include demonstrations on Graduation Day. Whatever escalating tactic they choose to pursue it will be critical to continue to expand the support that GWC members had already gathered among undergraduate students, other university workers, and other unions and members of the community. Next articleStrike Looms in California – Support UC Workers! Amazon Pulls Out of New York!